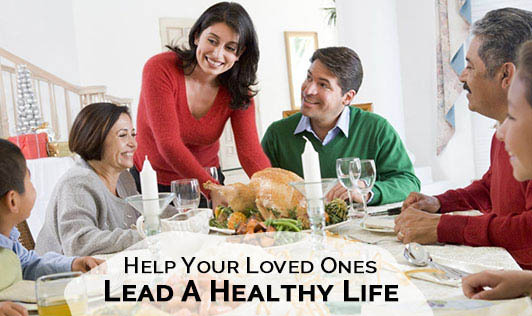 Help your loved ones to the road of health and fitness by practicing "random acts of fitness". There are dozens of small things you can do every day to make healthy living as easy as possible. Sometimes, you can end up helping create good habits without them even realizing it. Keep a variety of foods from different food groups in the kitchen. Make sure you talk to them about other things besides weight loss and fitness. Stock kitchen with healthy cookbooks, leaving them where people can find them. Get the junk food out of the house. Plan an active activity post dinner. Make it a habit to play outdoor games together. Cook at least three times a week. Invite them to take part in a fundraiser that supports something important to all of you. Get a physical examination done and urge them to do the same. Give "active" gifts, like personal training packages, a bicycle, roller blades, etc. Be straight up and let them know you're concerned about their health. Start a garden that you can work on together. Suggest walking more than driving. Make their exercise a priority. Try to make it easy for them. Sneak healthy snacks and a friendly note (maybe even a love note) into their lunch, briefcase, jacket pocket or purse. Prepare their favorite dish in a healthier way. Opt for activities as an excuse to spend time together. Give big, positive attention to changes that are made. If it's your turn to pick, choose a healthy restaurant or one that's within walking distance.